The Instant Pot is the only gadget that can replace a slow cooker, rice cooker, and stockpot, and this is the only cookbook with 175 recipes, including more than 30 paleo and gluten-free recipes, for this device. You will love this collection of breakfasts, sides, soups, appetizers, main dishes, and desserts—instantly! "If you haven’t heard of the Instant Pot, you’re living under a rock! Pick up your favorite new piece of kitchen equipment and a copy of food blogger Michelle Fagone’s handy book and start instant-cooking everything!" "The cookbook offers a simple primer in the beginning about how to cook with the Instant Pot and each setting. The format is very easy to follow. The collection of recipe options in the newly released I Love My Instant Pot Recipe Book offer so many quick options for every meal." "The I Love My Instant Pot® Recipe Book is about more than just dinner recipes – and it really opened my eyes to the variety of dishes that I can make … [and] has some really awesome recipes. Michelle’s clear instructions on how to use the settings … eliminates any guesswork with her recipes." "This book has so many wonderful recipes, some of them I had no idea I could even make in my instant pot. Some of the recipes have bright colorful pictures that make you want to make the recipe. 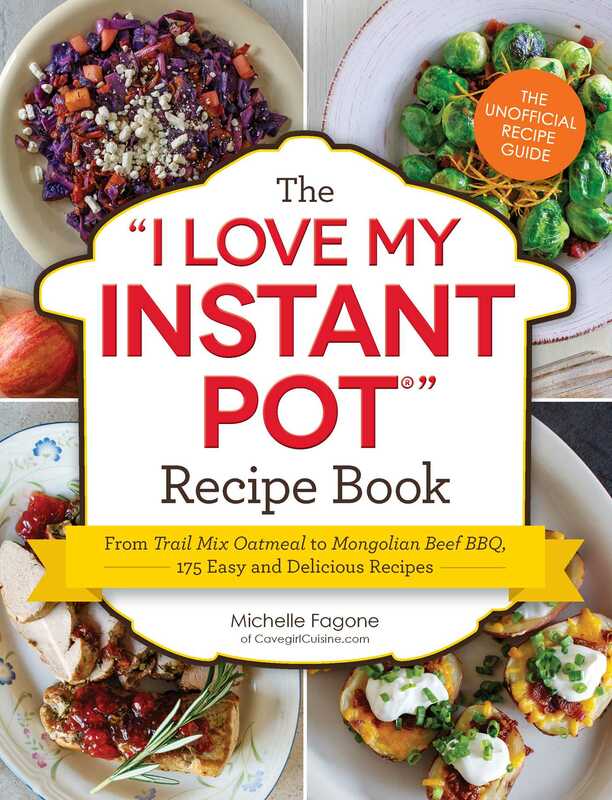 This is now my go to book for all things instant pot." "I can totally relate to the title as I've completely fallen for the easy and efficient way a meal comes together in the Instant Pot. Check out Michelle's Instant Pot recipe book for even more great vegetarian, paleo and gluten free recipes." "This book certainly made me think a little more outside of the box when it came to new ways to utilize my Instant Pot." "A real, no-nonsense book. It starts out with a short introduction that explains why you should cook with an Instant Pot. Michelle then goes on to explain the different settings on Instant Pots, the different cooking methods, Instant Pot accessories, and how to clean your Instant Pot. I am looking forward to putting it to good use this summer – it should help keep the heat in the kitchen down compared to using my oven." "This book is the perfect companion piece for my Instant Pot with 175 easy-to-follow recipes that are both quick to pull together and tasty. Not only does Fagone cover Paleo and gluten-free meals, but also vegetarian and gluten-laden options such as mushroom risotto and macaroni and cheese. My absolute favorite recipe is the Sweet Potato Morning Hash — it’s the perfect meal to have after a good workout session. It’s a nice combination of savory and sweet and is incredibly easy to prepare."